It’s February, and it’s cold pretty much everywhere. But that’s not slowing us down one bit, as we’re heading into a big weekend full of college hoops, awards shows, and…more football? It’s the opening weekend of the Alliance of American Football (AAF), an exciting new professional football league that’s keeping the football action going for fans around the country who aren’t quite ready for the season to be over. PSSI Global Services, in partnership with our friends at AT&T and CBS, has a significant presence at all four of the opening weekend’s games. CBS has us at both games on Saturday, which will air on CBS and the CBS All Access platforms. Justin Roszak and the C12 will be at Spectrum Stadium at the University of Central Florida in Orlando on Saturday, when the Atlanta Legends face the Orlando Apollos. John May will have the CK48 mobile teleport at the Alamodome in San Antonio, TX for more AAF when the San Diego Fleet face the San Antonio Commanders on Saturday evening. And Sunday has us plenty busy, as well. Rick Ball and Gary O’Donovan will be at Legion Field in Birmingham, AL on Sunday when the Memphis Express play the Birmingham Iron. 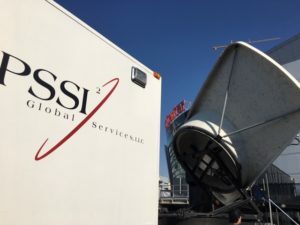 The PSSI International Teleport (PIT) will take down their signal and put it on the AT&T Global Video Services network for broadcast distribution. In Tempe, AZ, Paul Blomstrom will be on board the CK35 mobile teleport at Sun Devil Stadium for Sunday’s game between the Salt Lake Stallions and the Arizona Hotshots. Paul’s transmission is quite complex, as he will be multiplexing eight cameras via satellite to PIT, who will distribute the signals back to our stack of decoders at Sneaky Big Studios in Scottsdale, AZ. There our friends at SBS will produce the game for broadcast. Paul’s also going to provide IP bandwidth via satellite – again with help from PIT – for the production crew at Sun Devil. As if that weren’t enough, our K34 production/uplink hybrid is parked at Sneaky Big Studios to provide remote production services for the pre-game and halftime shows at all four AAF games. Kyle Meyer will be there to oversee the at-home production. We’ll be providing these services every weekend for the duration of the AAF season. Between production, data, fiber, and teleport services, we are clearly much more than a satellite uplink provider. But we will always be the number one satellite transmission services provider in the US! Just look at our college basketball lineup! Dave Buckman and the Columbia truck were at Stabler Athletic and Convention Center at Lehigh University in Bethlehem, PA on Monday, when the Colgate Raiders beat the Lehigh Mountain Hawks. From there Dave headed to the Pavilion at Villanova University for Wednesday’s game between the Creighton Bluejays and the Villanova Wildcats. Steve Hagerty and the K18 were back at the Carrier Dome in Syracuse on Tuesday, when the Syracuse Orange lost to the Florida State Seminoles. And he’s back on Saturday when the Orange host the Boston College Eagles. Dave Mitchell and the Wolfcoach truck were at the Liacouras Center at Temple University in North Philadelphia, PA on Wed when the Connecticut Huskies took on the Temple Owls and lost 63-81. From there Mitch headed up to the Reilly Center at St. Bonaventure University in Olean, NY, where the VCU Rams face the Bonnies on Saturday. Nick Ray and the NT22 will be at the Ryan Center in Kingston, RI on Saturday when the University of Rhode Island Rams take on the Dayton Flyers. Big game in LA this weekend, as the Utah Utes are in town to take on the UCLA Bruins. 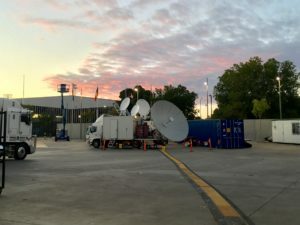 We’ll have two trucks there for our friends at Fox: Larry Sheets and the LA Sprinter will handle the Ku-band path, while John Jennings takes care of C-band in the Atlas truck at Pauley Pavilion. Back east, Dennis Smith and the NT21 truck will be at Allan P. Kirby Sports Center at Lafayette College in Easton, PA on Sunday when the Holy Cross Crusaders take on the Lafayette Leopards. Plenty more hoops to come next week! A couple of hockey games on our schedule this weekend. Rick Kolinek and the K22 truck will be at the University of Wisconsin-Milwaukee’s Panther Arena on Saturday for more AHL action, as the Chicago Wolves face the Milwaukee Admirals. And Mike Sheehan is WAY north of the border at West Central Events Center in Kindersley, Saskatchewan on Saturday for Junior Hockey. Mike’s been growing out his beard to help stay warm! And how about a little tennis? Benny Griffis and the C31 are at US Cellular Center in Asheville, NC for the International Tennis Federation’s Fed Cup, the premier international team competition in women’s tennis, which will feature USA vs Australia. Just one golf tournament on our schedule through this weekend: Chris Golden and the C23 truck are at The Old Course at Broken Sound Club in Boca Raton, FL for the Oasis Championship. Chris will be there for our friends at Golf Channel through the final round on Sunday. Next week for Chris: the Chubb Classic in Naples, FL. It’s time to start racing! The NASCAR season kicks off this weekend! Ben Bradshaw and Jonathan Ayala are at the helm of the C27 mobile teleport at Daytona International Speedway for Speedweeks. This invitation-only event includes the Advance Auto Parts Clash and the Daytona 500 practice and qualifying as well as other racing events. Our truck and engineers are the hub for satellite and fiber transmission services, as the C27 will the mobile POP for the AT&T Global Video Services fiber network throughout the circuit this season. Exciting stuff! Plenty of fighting on the schedule, especially here in the great state of California! Wes Hill’s on his way to Fantasy Springs Casino in Indio, CA for another DAZN boxing event. Wes is there to provide multiple video paths for distribution across DAZN’s platforms around the world. Mark Huss and Oscar Zapata will also be in town to provide ringside commentary services for international broadcasters. It’s Rey Vargas versus Franklin Manzanilla in the main event, as they will battle for the World Super Bantamweight title after a host of exciting undercards. Not too far up the road in Fresno, Steve Chaisson will be at the Save Mart Center for Sunday’s Top Rank on ESPN boxing event. Steve’s providing a three-channel mux for our friends at ESPN for distribution across their platforms, including ESPN+. The main event features Jose Ramirez defending his 140-pound world title against Jose Zepeda. Should be a great fight! And right here in LA we have another fight at the newly christened Dignity Health Sports Park (formerly the StubHub Center). Strategic Television project managers Victor Verno and Michael Hollander join engineers Joe Cox and Jose Sanchez for the domestic and international transmissions of Showtime Championship Boxing on Saturday night. Undefeated super featherweight champion and power-punching menace Gervonta “Tank” Davis defends his title against all-action brawler and former world champion Hugo Ruiz in the main event. Setting up in Melbourne for UFC 234. In another hemisphere altogether, we are working with our friends at Concom to originate another UFC pay-per-view from Australia. This time we are at the Rod Laver Arena in Melbourne to provide multiple transmission pathways to UFC fans around the world. Senior engineers Jim Flowers and John Bright are joining forces with our friends at Sydney Teleport Services to provide extensive satellite and fiber transmission services. Project manager Garrett Hunt is on hand to ensure clean distributions to head-end PPV providers around the world. We’re leaning heavily on our resources at PIT for the North American and Latin American pathways, and what better way to introduce our brand new full-time link between Pittsburgh and Sydney than with this enormous event? Our team has spent the last few months finalizing a high capacity, bi-directional trans-Pacific fiber link between the PSSI International Teleport and the Sydney Teleport. This full-time service provides heretofore unprecedented access to the Asia-Pacific region for North American events, as well as a North American distribution pathway for content from Australia and other Pacific Rim markets. Thanks to everyone involved in this undertaking, as it significantly increases our capabilities and presence in global signal distribution and management. Last, but not least, we have a couple of special news and entertainment events to round out an action-packed week. NT2 at the Democratic response to the SOTU. Earlier this week, PSSI News Group’s Lorenzo Dottori was the pool feed for the Democratic response to President Trump’s State of the Union address. A lot of eyes were on Lorenzo’s feed, as all major news organizations picked up his signal for live broadcast. Rick Varney’s getting all set up at Chelsea Piers in Manhattan with the CK25 mobile teleport for Fox’s multi-day coverage of the Westminster Kennel Club’s 6th Annual Masters Agility Championship. 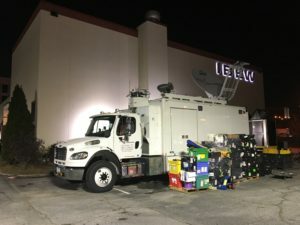 Rick will be providing C-band and Ku-band transmissions through Tuesday in NYC, and we’re all hoping a few of the competitors will join Rick in the truck! It’s time for the Television Critics Association’s winter press tour, and we’ve been busy providing remote inserts into the Langham Huntington Hotel in Pasadena for television critics and executives to get a look at what’s happening across the world of television. Project manager Eric Hall is in Austria as we speak providing transmission services for a high-profile TV star. We’re working with our friends at Nextologies to provide an IP-based origination feed from Austria that our team at PIT will ingest for satellite distribution to our downlink antenna in Pasadena. Yet another example of our multi-modal capabilities in moving content around the world! Ron Ford will have a high-profile transmission of his own into the TCAs on Sunday, as he’s in Houston to work with NASA on another live shot. And we are very happy to be back at the Grammys. The 61st Annual Grammy Awards will air live from the Staples Center in Los Angeles on Sunday night. Senior engineer Brian Blomstrom will handle CBS’s domestic transmission, while Strategic Television VP, Jason Land, will work alongside project manager Logan Schinto and Chris Hovden for the massive international distribution of the big show. This year’s show will be hosted by Alicia Keys, and features live performances by Cardi B, Diana Ross, and Janelle Monae. PSSI News Group will also be there for our friends at CNN! Bob Tweed and David Conwell will be in the press compound to catch all the red carpet hullabaloo. It’s going to be a star-studded night in LA! Still more – always more – to come next week. Stay tuned!